England will face Malaysia in Saturday's final of the Women's World Team Squash Championship in Canada. Third seeds England, chasing a first title since 2006, defeated first-time semi-finalists Hong Kong 2-1 on Friday. 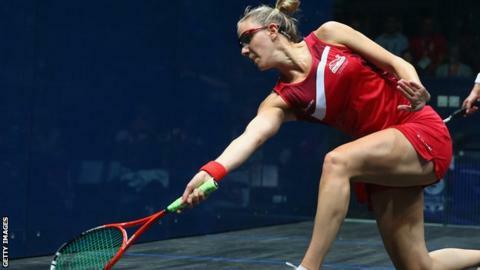 Laura Massaro gave England the lead but world number five Alison Waters was defeated before Sarah-Jane Perry triumphed to seal victory. Malaysia reached the final for the first time after beating defending champions Egypt 2-0. World number one Nicol David helped Malaysia on their way when she extended her unbeaten run since 2004 to 32 matches with a four-set win over world number three Raneem El Weleily. England started their semi-final strongly when Massaro, the world number two, beat Annie Au, ranked ninth in the world, 11-7 13-11 11-4 in 35 minutes - saving four game-balls in the second. But Waters lost for the first time in eight meetings to number 23 Joey Chan who forced a decider with her 11-4 8-11 11-9 11-3 win. Event newcomer Perry, who is ranked 17 in the world, squandered a 10-3 lead in the opening game to lose it 12-10 before recovering to take the next three 11-5 11-3 11-8 against Hong Kong's Tong Tsz-Wing, ranked 31 places lower. "We're happy to be in the final for the 11th time in a row - but we will need to improve on our performance if we're to be successful in the final." said coach David Campion.